This post is about three of them, of the smaller ones, but ones that work so nice together it feels they were made by the same person. There’s a Twitter app, a Terminal app and a sound effects thingy (??). One of the things most people fear when they think about Linux is the time they’ll have to spend using terminal, instead of the usual point and click applications we’ve grown so used to. After using Linux for a while now, I can tell you the time you’ll spend using terminal is not really that much time, unless you want to. I would guess the initial period would be the most terminal-heavy, since you’re installing and configuring stuff, but even then it’s down to a minimal, if you pick a distro that won’t force you to go into terminal mode. Anyway… Being old school, I love me some terminal. 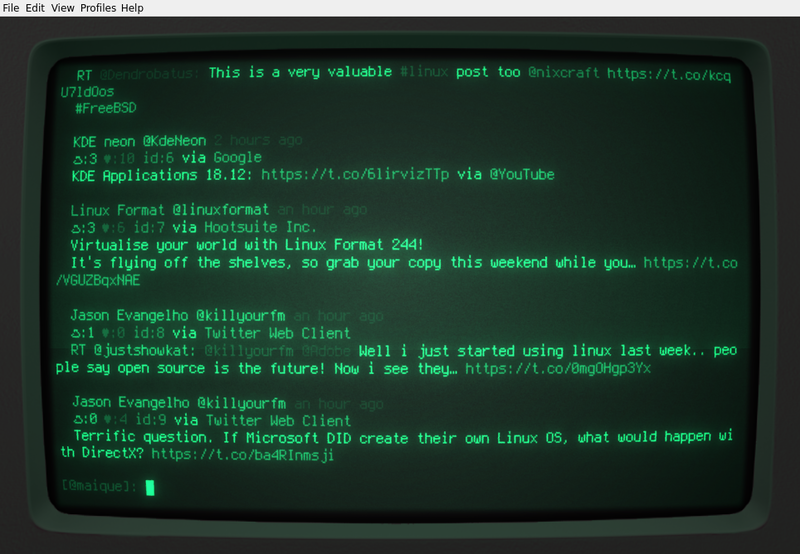 Other people seem to love it too, so there’s a cool old school terminal emulator. And also a twitter app that is terminal-only. The only thing missing was the cool sound of the older keyboards, but someone else thought about this too!